Object Oriented Programming is a programming approach which familiars us with the concepts of classes, objects, inheritance, polymorphism etc. OOP shows the relationship between the objects, how they relate and how they communicate with each other in order to manipulate data. It is beneficial in many ways as well as it has countless applications. OOP makes easier to design the software. It’s easy to test, debug, and maintain. OOP coding is more accurate than the procedural coding. Hiding and abstraction make the data safe and secure, with less data corruption. OOP is most demandable because of writing sizeable and composite software. Due to its wide range, it has many applications. Some of the applications are discussed below. A system is said to be Real-Time if it is required to complete its work and delivers its services on time i.e Flight Control System etc. Object-oriented techniques make it easier to control the complexities related to real-time system design. These techniques give an integrated framework which involves the schedulability analysis and developmental specifications. Hard Real-Time System: Purely deterministic and 100% time constraint system i.e Satellite launching stations, Missile launching stations and Air Bags Controls in cars etc. Soft Real-Time System: The meeting of the deadline is not compulsory for every time or for every task but the process should be processed and give the result i.e personal computers, audio, and video systems etc. The varying specification of variables makes it difficult to build complex systems such as ecology, zoology, and agronomic systems. Modeling and understanding interactions explicitly are required for simulating complex systems. Object-oriented Programming gives the substitute approach for making these complex modeling systems easier. The object-oriented database enables us to represent data in the form of objects. It permits developers to model complex data easily and captures the relationships in a natural way. It is also known as Object Database Management Systems (ODBMS). To let the object maintain their identity and integrity, these databases try to balance a relationship between the real-world and database objects. Identities of objects are identified and operations are then performed on these objects. A client-server is a software structural design model comprises of client systems and server systems, both of which communicate over a computer network or may communicate on the same computer. Because of object-oriented programming, Client-Server Systems offer the IT infrastructure i.e operating systems, networks, and hardware etc, creating object-oriented Client-Server Internet (OCSI) applications. These models have also structural functionality for email exchange and Web/database access. Hypertext means text augmented with links. OOP also helps in laying out a framework for Hypertext which is suitable for various media approaches. Hypertext is basically similar to that of regular text as it can be stored, searched, and edited effortlessly. The main disparity is that hypertext is text with pointers to other text as well. Hypermedia is an extension to hypertext that gives facilities like handling sound and video. It’s a superset of hypertext. Documents having hypermedia, not only have links to other pieces of text but also to various other forms of media, varies from images to sound. It is very useful in addresses the setback of prediction and estimation of complex time-varying systems. Firstly, the whole time-varying process is divided into numerous time intervals. Then, neural networks are developed in a specific time interval to scatter the load of several networks. OOP simplifies the whole process by simplifying the estimation and prediction capability of networks. These involve formal and informal electronic systems mainly concerned with information sharing and communication to and from people inside as well as external of the association i.e email, Word processing, Web calendars, Desktop publishing etc. OOP can also be used in developing and designing the applications as it allows people to trim down the effort involved. Such as, it is used in designing blueprints, flowcharts, etc. OOP makes it easier for the designers and engineers to produce these flowcharts and blueprints perfectly. These are computer applications which use databases of expert knowledge to make decisions in many areas as medical diagnosis. Their advice and decisions are beyond the reach of a human brain as they are reliable, highly responsive and understandable. 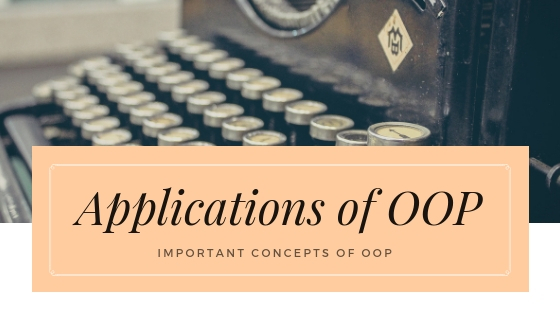 There are many more applications of object-oriented programming OOP is widely used in developing and designing applications such as office automation systems etc. It reduces the effort involved in manufacturing applications.